1. Customers and employees get injured. 2. Griils break down and sales drop. 3. Due to insufficient heat power, grills do not allow customers to enjoy delicious meals. 4. There is an increase in utility costs due to diminished heat efficiiency. ■　Maintenance Manual (Download the PDF file). *They are updated on July 6, 2016 to revise safety marks. Cleaning: Ensure the grill and exhaust fan are turned off before cleaning to prevent injury such as burns. Video manual : How to take a care of Shinpo Grill in daily service. Clean using a wet cloth any time as necessary. Wash using a sponge (grainy surface) once a day. Clean using steel polisher regularly. Radian Plate:Wash using a sponge (grainy surface) once a day. Ceramic Charcoal: Use a wire brush to remove grease from the burner ports so that they are not clogged. Do not wash with water. Sana: Wash using a sponge (grainy surface) once a day. 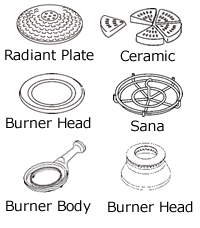 Burner Head and Burner Body: Once a day, be sure to use a wire brush to remove grease to prevent clogging. Tap with plastic or wooden hammer several times to remove rust and filth regularly. Drain Pan: Supply water after every other guest at the table regardless of how much water is left. Wash using a sponge (grainy surface) once a day. Inner Casing: Once a day, wash in hot water using a sponge (grainy surface. Outer Casing: Froth up a sponge (grainy surface) with soapy water and wash with the bubbles after draining. Then wipe off with a wet cloth. 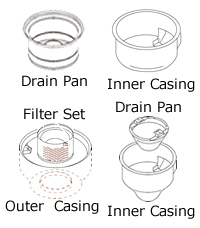 Filter Set: Once a day, wipe off grease attatched on the surface with a dry cloth. Replace oil catcher and wash filter set with hot water using a sponge once every other month. Once a day, wipe off grease with a wet cloth as far as you can reach. The connectiong tube cannot be broken up. 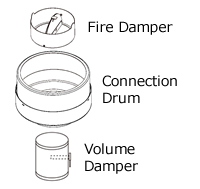 Fire Volume Damper can adjust the air volume,and the risk of fire willbe decrease. 3D filters: Wash 3D filters with soap every time the table is turned over 30 times, every 50 hours of use, or every other week. The filter can be washed in a dishwasher. If the filter is not washed, grease will accumulate in the ducts and may cause a fire. C Box: Insert a rag in the cleaning rod accessory. 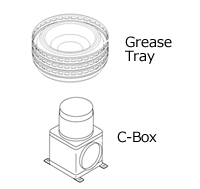 Wipe grease accumulated at the bottom of the C Box with the cleaning rod weekly. The C Box cannot be disassembled. Heat is weak or unstable. Step 1: The gas burner is clogged with grease--remove grease using a metal brush. Normal heating power When there is insufficient air, remove grease using a metal brush. Turn the gas burner up-side down and tap it to remove scum accumulated inside the burner. Sometimes, soot in various sizes comes out. Step 2: Adjust the air intake with the gas burner's damper. Remove the gas burner. Turn the screw to the left using a screwdriver to loosen the damper. Turn the damper to the left to lower air intake. Turn the damper's screw to the righ to tighten. Replace the gas burner. Restore normal operations. There is no ignition sound when pressing the ignition switch. →　１）The cord is not plugged in the power outlet. →　２） The circuit breaker is switched off. Please turn it on. *If there is still no ignition sound even after turning on the circuit breaker, the electrical system of the grill may be short-circuited. Please contact a Shinpo representative. When turning on the ignition switch, there is an ignition sound but ther is no flash on the burner. →　The safety valve inside the main gas tap may be closed. After turning off the main tap, turn on the tap slowly. When turning on the ingnition switch, there are ignition sounds and flashes on the burner but it does not ignite. →　A nozzle inside the insertion part of burner (the grill body side) may be clogged and gas is not flowing. Insert the special nozzle cleaning rod into the nozzle hole to clean. ＊Please do not wipe the tip of the nozzle with a dirty cloth. This will make the nozzle dirtier. →　The burner may be tilted. Please adjust it. →　Burner holes may be clogged. Clean the holes using the special nozzle cleaning rod. →　Burner may have been degraded. Please replace it with a new grill. Alarm keeps beeping even though flames from the burner are even. ＊The overheating prevention system has been activated. After taking the following steps, the grill will cool down in 5-10 minutes and the alarm will stop. ＊To continue to use the grill while the alarm is sounding is very dangerous. Do not use the grill under any circumstances when the alarm goes off. →　There is no water in the drain pan. →　Parts are soiled with grease and flames for grilling are drawn into the inside of the device. 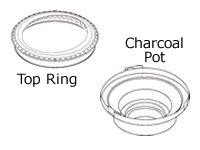 →　Due to clogging, gas that cannot exit from the hole does not fully combust at the insertion portion of the burner. Grill does not work well. →　Adjust the burner so it is level. Rust inside the burner may have caused the clogging. →　Lightly tap the burner with a mallet to remove rust inside. Burner holes may be clogged. →　Clean the burner holes with a metal brush or the cleaning rod. Burner may have been degraded. →　Please replace it with a new burner. Exhaust fan is not operating. →　If the exhaust fan or circuit breaker is switched off, turn it on. Although the exhaust fan is working, 1 or 2 units are not venting smoke. →　The fuse of Fire Dumper or Fire Ventilation Dumper inside the grill may have been burned. Please replace it with a new one. Although the exhaust fan is working, smoke is not being vented with all grills of a certain model. →　There may be problems with the fan of the model in question. ・The fan is filthy. Cleaning is poor. ・Wet cloths and other items have gotten into the fan. ・The fan or fan belt is worn out. Contact Shinpo by email or telephone for consultation or an order. Providing parts free of charge under warranty is limited to the appropriate use of the grills. Be aware that when parts made by other companies or outside specifications are attached to a Shinpo grill or when cleaning has not been done properly, warranty service is not applicable.